RECIPE TITLE "Mexican Quiche Recipe"
This Mexican Quiche takes all the best ingredients of a rich and creamy quiche and adds the essential elements of Mexican cooking: drop in Mexican cheese, diced green chiles and salsa prima. 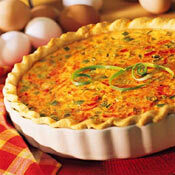 Sprinkle cheese, bell pepper, chiles and green onions onto bottom of pie shell. Combine eggs, salsa and evaporated milk in small bowl until blended. Pour into pie shell. Bake for 40 to 45 minutes or until knife inserted halfway between center and edge comes out clean. Cool on wire rack for 15 minutes. Garnish as desired. For a lower calorie version, substitute shredded light cheese and Nestlé Carnation Evaporated Fat Free Milk. Recipe reprinted by permission of Ortega&reg. All rights reserved. Farberware® Egg Beater Grab the oversized, comfort-grip handle and turn the crank to get the two whisks madly twirling to create plenty of whipping action, giving eggs and cream that light and airy texture good chefs prefer. Stainless steel. 9" long. Farberware® Professional Duel Egg Mushroom Slicer Reduce tedious slicing to a single, easy motion. This 2 way egg and mushroom slicer creates perfect slices of hard-boiled eggs for salads, or mushrooms for pizzas. 8 1/2"
Daybreak Egg Plate This Egg Plate will be an everyday favorite. A fun way to serve breakfast or host luncheon entrees, cookies or snacks. 6 1/2" x 4 1/2". Daybreak Egg Bowl While small in size, this bowl makes a considerable statement at any place setting. Originally envisioned for serving a single hard - or - sorft boiled egg, it can also be used for setting our after-dinner candies. Scatter several about the room offering small snacks. 3 oz. Daybreak Deviled Egg Plate This versatile plate can be used for more than just serving deviled eggs; crab-stuffed mushrooms, chocolate-covered strawberries and prosiutto-wrapped melon balls certainly come to mind. 11 1/4" x 9". Winterberry Sculpted Deviled Egg Plate, Christmas Tree Shaped This versatile plate can be used for more than just serving deviled eggs. Celebrate the twelve days of Christmas by placing savory chocolates or small gifts in each spot. The plate itself is shaped like a Christmas tree, topped by a merry bow. 12" x 10 1/4".